Note: Our standard cushion care tips are also relevant to outdoor cushions, as well as the information below. 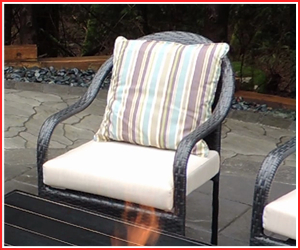 Spills – All our outdoor fabrics are spill resistant. At first contact between the liquid and the fabric, the liquid will “pill up” on top of the fabric and can easily be wiped off. After this is done, your foam cushion is perfectly safe and does not require further attention to protect it. Rain or snow – Light rain or snow can typically be treated as no more than a spill. However, in cases of repeated or prolonged exposure, the moisture will eventually soak through the fabric or the stitching. In extreme cases, the moisture will soak all the way into the core of the foam, requiring immediate attention. Internal condensation – the most rare of the three types of moisture intake, this can occur quite rapidly when a cushion is completely sealed and not breathable. Typically this happens when plastic is used to seal and protect the inner foam cushion. Because plastic has no seams or breathability, condensation can form inside the plastic and mould can begin to grow during dramatic temperature changes that often occur outside. Outdoor fabrics – we’re proud to offer a great selection of colours and patterns in a number of vinyls and fabrics. Vinyls provide more protection from the elements, but are less comfortable and breathable. Sunbrella outdoor fabrics sacrifice a small amount of waterproofing but can make that up in comfort and breathability. Outdoor foam – such as our QuickDri rather than a standard upholstery foam. One of the biggest factors is whether or not you can protect your outdoor cushions from sudden onsets of rain. When it rains, are you going to be able to run outside and grab your cushions and bring them in? Or will they already be in storage when they’re not being used? Or are they to stay out in the weather all the time? If they’re going to be subject to the elements often, then we’d recommend you purchase QuickDri foam. If you’ll be moving the cushions in and out of the weather, you can likely just purchase an indoor foam, with an outdoor weather resistant cover.